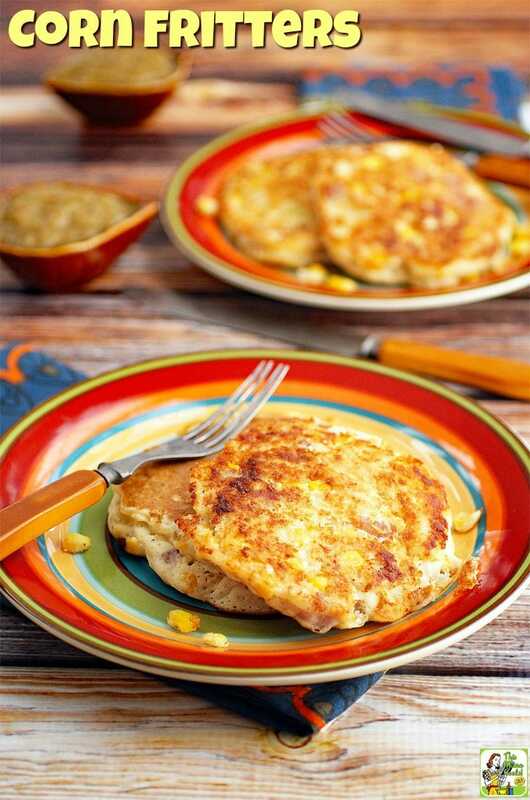 Try Corn Fritters as a different sort of pancake for Shrove (Pancake) Tuesday. Don’t let the name fool you! 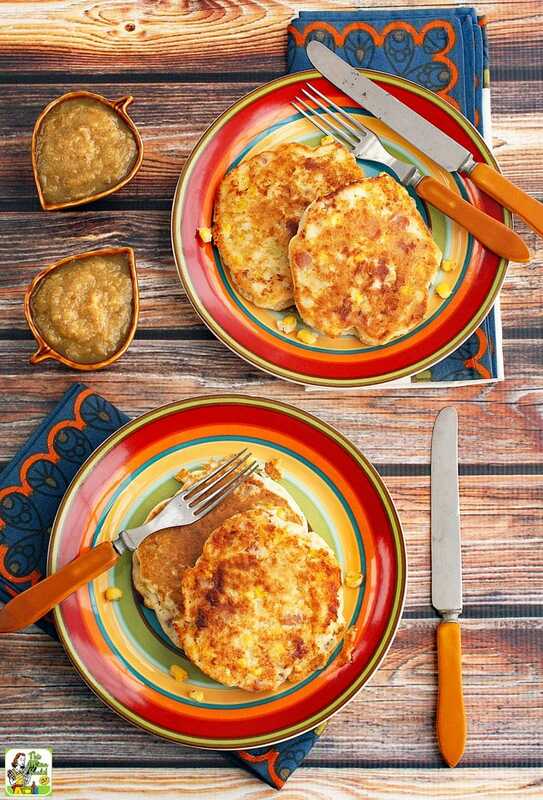 This gluten free corn fritter recipe is a pancake recipe. 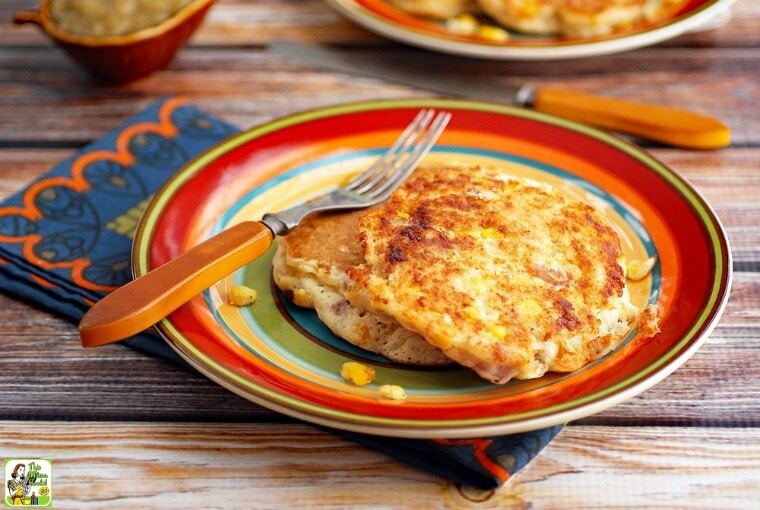 This easy corn fritters recipe is perfect for Pancake Day. Even better, since Corn Fritters are savory and not sweet, it makes a terrific brinner (breakfast for dinner) dish any time of year. So what’s the difference between these corn fritters and a pancake made with the same ingredients? According to The Old Foodie: “Not much really.” HA! Some corn fritter recipes are thick and pancake like, while others look like deep fried blobs of dough. My gluten free corn fritter recipe is more pancake like – and fairly wholesome since it’s not deep fried. This corn fritter recipe is actually my husband’s concoction for what he calls “corn pancakes.” It’s been a Christmas morning staple at our home for years. Paul came up with these easy corn fritters when he was living in Berlin and only had some frozen corn, eggs, flour, milk and some ketchup to make breakfast with at his friend, Thomas’s home. When he came back to the States, made them for me. I loved them so much that I always request them for special occasions like birthdays and holiday brunches. I’ve taken Paul’s corn fritter recipe and made it gluten free by using an all purpose gluten free flour like Bob’s Red Mill Gluten-Free 1-to-1 Baking Flour. Then I made the corn fritters dairy free by using plain rice milk. You can also use unsweetened coconut milk or unsweetened soy milk. I used whole eggs in my easy corn fritter recipe, but you can health it up even further by using the equivalent of two eggs worth of eggs whites. When I lived in Georgia, I used country ham, the Southern version of prosciutto, in my corn fritters. Instead, you can use thickly cut ham deli slices, meaty bacon, pancetta, sausage, or even spicy chorizo! Or forgo the meat altogether in this gluten free corn fritters recipe and add some sautéed diced peppers instead. That way you now have a vegetarian corn fritter recipe! Just because these corn fritters are savory, it doesn’t mean you can put your favorite sweet syrup on them. Some ideas because pancake syrup are real maple syrup, agave nectar, honey, or sorghum syrup. My family likes these yummy corn fritters with ketchup, including my homemade Green Tomato Ketchup as shown in the picture above. Try it, you just might like it! Heat pancake griddle, skillet or frying pan. Combine all purpose gluten free flour, baking powder, salt, pepper, and sugar in a large bowl. In a small bowl, add eggs to rice milk and beat until combined. Pour milk and eggs into flour mixture and stir until combined. Add corn, onions and meat if using. If batter seems thick, add more rice milk. Using a 1/4 cup measure, spoon out batter on to hot griddle. Cook pancake until each side is golden brown. Keep corn fritters warm in oven until served. Originally posted on December 12, 2013 and February 26, 2017. Updated with new pictures and information. Looks yummy, I have to try this. Thanks! I love corn fritters and you’ve just reminded me that I haven’t made any in a long time. Thanks for reminding me. But, I’ve never had them with ham. Mireya, you can add anything you want to them – little pieces of leftover ham, sauteed veggies, cheese, etc. It’s a great way to use up some leftovers, too!